But just before it dies out definitely, they teach you in speed classes how to do things nobody asks you to do anymore. Does she mean nothing at all? Well, I guess Marie-Jo is a rare exception among the species of the Parisian concierge. Like most of them she is of Portuguese origin. Mine is too. She doesn’t read a single newspaper, but she’s always up to date. She hears everything and tells it all. She needs to gossip otherwise she will die from a stomach ulcer. That’s why she tells me everything, every little detail about each occupant of our building: illness, bank statements, adulteries, divorce cases, diets, you name it. The other day she was telling me about a world famous architect who used to live in our building. She used to clean his apartment. She told me everything about his young mistress for whom he had left his wife. She even kept books about the number of Viagra pills in his bathroom. She told me also, that his young mistress had left him for a man with whom she had a baby. And then, she told me, he moved back to his beloved wife. I’m telling you all this, just to show you how important a concierge is for the social health of a community. 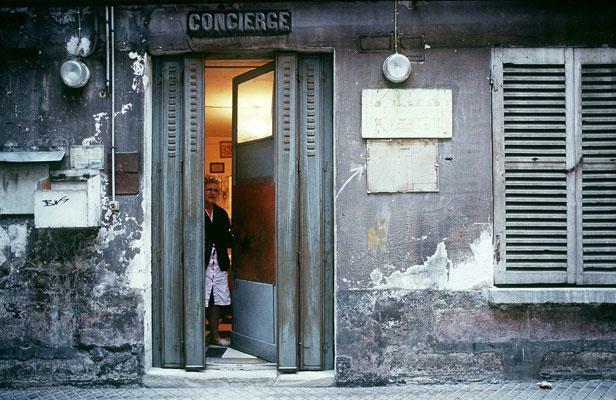 Thirty years ago, on the ground floor of almost every apartment block in France was a loge in which a concierge ruled over everybody walking in or out. It was often a middle-aged (or slightly more than middle-aged) woman of Portuguese origin who not only kept the house clean, but looked after your mail, watered your flowers or fed your cat while you where out of town. But now it’s all declining. At the beginning of the 80’s, Paris had 30,000 concierges. Today it only has half the number. And the new school, inaugurated by Housing minister Benoit Apparu, will not change this. Unfortunately.